Barite is the most common barium mineral produced in low-temperature hydrothermal veins, such as quartz - barite veins, fluorite - barite veins, etc. Barite is non-renewable resource and it's one of China's export mineral ore with great advantage, widely used in oil and gas drilling mud aggravating agents. Barite crushing plant is used for crushing barite raw materials into barite powder applied in petroleum, chemical, paints, fillers, construction, concrete, aggregate, paving materials etc. In barite crushing plant, barite crusher usually takes as the primary crushing equipment for first crushing process, barite grinder or barite grinding mill takes as the secondary grinding equipment. In addition to crusher and grinder, other optional equipments are also important such as feeder, screen, conveyors, washer or washing machine, making machine etc. Barite grinder includes ball barite grinder, Raymond barite grinder, vertical barite grinder, high pressure suspension barite grinder etc. According to the final products output size, we can divide barite grinders into coarse powder grinder and fine barite grinder machine etc. For example, ZENT MXB coarse powder mill is the typical coarse mill with simple structure, low running costs applied widely in primary grinding stage. Barite crusher is improved by stone crusher or rock crusher specifically used for barite crushing. In barite mine industry, barite raw materials are bulks and large size not suitable for industrial usage. Taking use of barite crushers, barite raw materials can be crushed into fixable final products for next use. Barite crusher includes jaw crusher, impact crusher, cone crusher, hammer crusher, mobile crusher station. All the above crusher can be used for crushing dolomite, flint, lead and zinc, serpentine, blast furnace slag, coal gangue, phosphorus ore and other medium hardness materials crushing operations, especially for hard limestone, dolomite, granite, basalt and other artificial sand or highway stone materials. 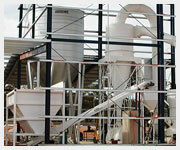 Barite crusher's service life depends on the operation and maintenance. You should pay attention to routine maintenance to ensure stable operation of the production lines.